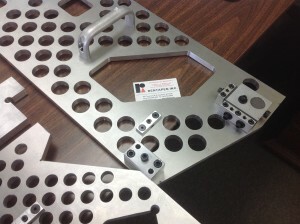 The other day I saw we were doing a lot of “pick-off” or “take-off” weld fixtures for a couple customers. I realized I have not even mentioned these fixtures yet in the years of this blog. IT IS TIME! Watch this crude, six-minute video. These simple fixtures are often used in tack welding smaller parts onto bigger parts. Tip 1 – Use holes and edges of the bigger part to locate the template. Tip 2 – Hold the template in place so it doesn’t move while welding. Tip 3 – Drill out inside corners to make them sharp if you are using that inside corner for locating the smaller parts. Tip 4 – Make it easy for the operator to lift and handle. Tip 5 – Mark it and plan for storage when the weld template isn’t in use. Woo hooooo!! We have our newest, latest, greatest catalog of RAPid Tooling Components(tm) printed in PDF and paper! If you prefer paper, just fill out the contact info and your request here. Dreaming about attending a big machine tool show? Here is a nice video about Fabtech – happening in Atlanta this Fall. It should get you salivating. Order a free 3D model of a RAPid Plate(tm) today. Once you sign up the first time, it’s easy and fast.